Heavy Bodied Clear PVC Cement heavy bodied, slow set PVC Solvent Cement. It is viscous (thick) and, carries very good gap filling properties. This cement is ideal for joining large diameter PVC pipes & fittings where the gap between pipes and fittings is large. 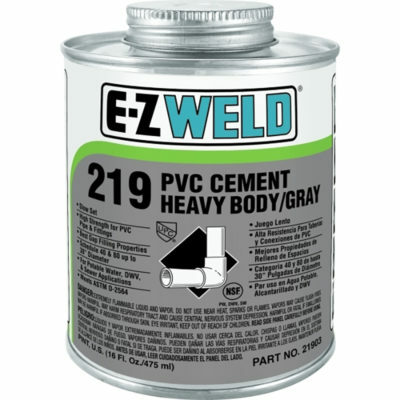 Heavy Bodied Gray PVC Cement heavy bodied, slow set PVC Solvent Cement. It is viscous (thick) and, carries very good gap filling properties. This cement is ideal for joining large diameter PVC pipes & fittings where the gap between pipes and fittings is large. All Temperature is a medium bodied, fast set PVC Solvent Cement. 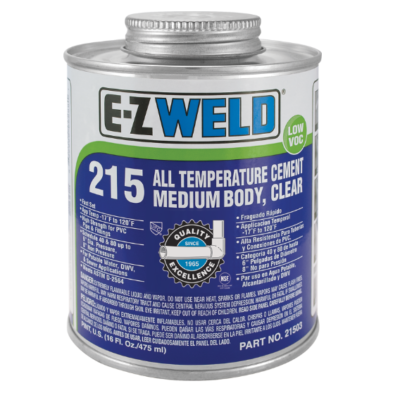 This cement is specially formulated for joining PVC pipe and fittings when temperature is below freezing. Blue cement is specialty formulated medium bodied, fast set, high strength cement. When joining large diameter pipe & fittings the use of primers is highly recommended. Medium Bodied Clear PVC Cement is medium bodied medium set PVC solvent cement. It is formulated to provide good gap filling properties needed to join large diameter pipes and fittings. 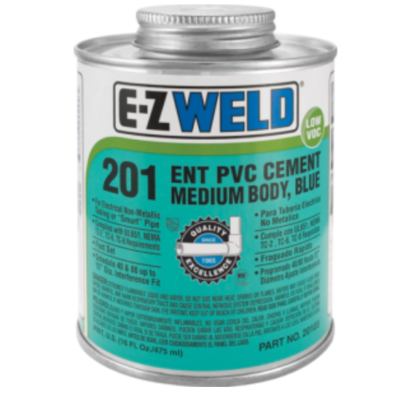 This is a medium bodied, fast set PVC Solvent Cement. 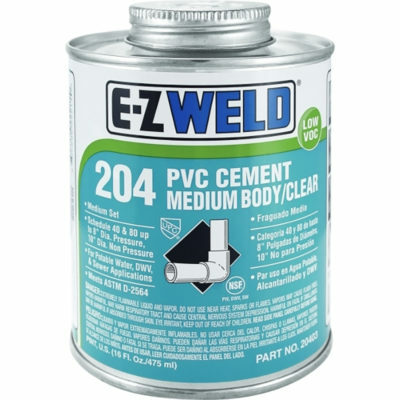 This cement is formulated for use on PVC pipes and fittings. It may also be used on small diameter pipes and fittings. 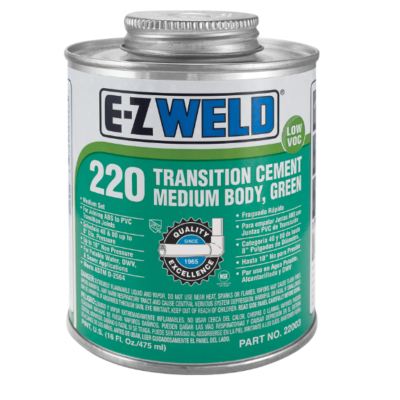 This cement is specially formulated for applications where working conditions may not be dry. 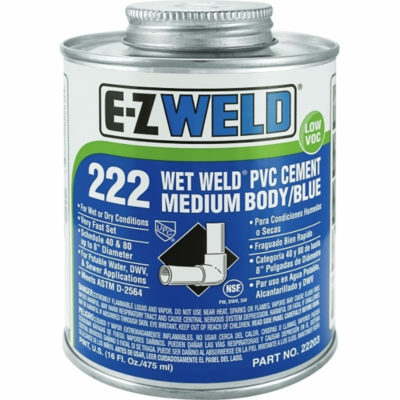 Medium Bodied Fast Set Wet Weld PVC Cement is a medium bodied, fast set, dark blue, PVC Solvent Cement. 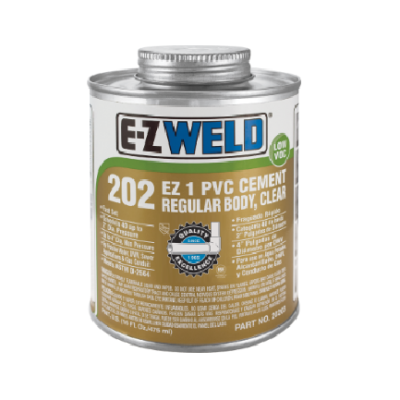 This cement is specially formulated for applications where working conditions may not be dry. 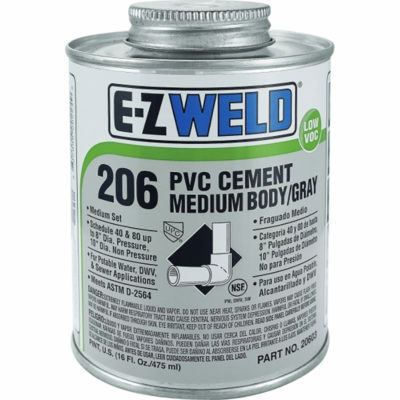 Medium Bodied Gray PVC Cement is medium bodied medium set PVC solvent cement. It is formulated to provide good gap filling properties needed to join large diameter pipes and fittings. Medium Bodied Industrial Grade PVC Cement is a medium bodied medium set PVC Solvent Cement. It is cloudy in color but dries clear. 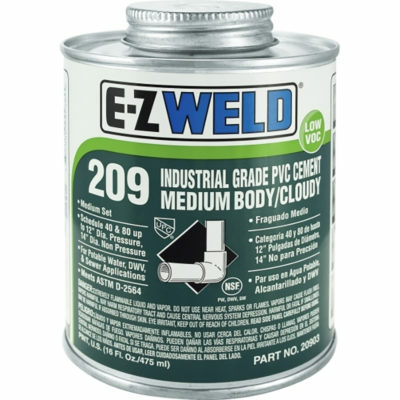 This cement is formulated to give good gap filling properties for pipes and fittings up to 12 “ diameters. 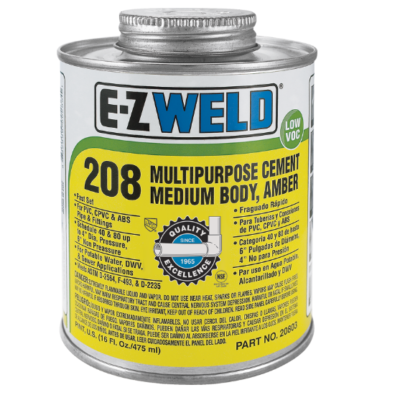 Multipurpose Cement is a medium bodied, fast-set Solvent Cement. 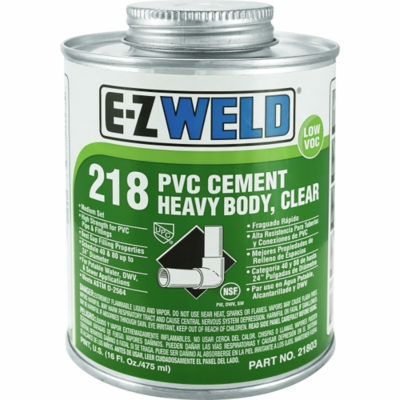 This cement was formulated for the joining of PVC,/uPVC and CPVC pipes and fittings. Regular Bodied Clear PVC Cement is a regular bodied, fast set, PVC Solvent Cement. This is the most commonly used product of the solvent cement family. 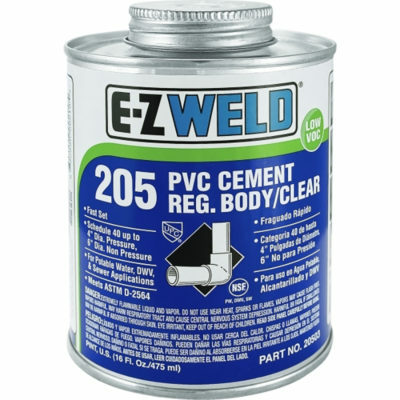 This is a regular bodied, fast – set PVC Solvent Cement. This cement is recommended for small diameter pipe applications. It is formulated to give maximum performance at an economical cost. 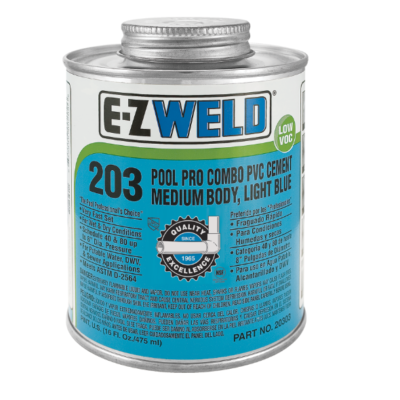 When used correctly, this product will make a consistently leak-proof joint. 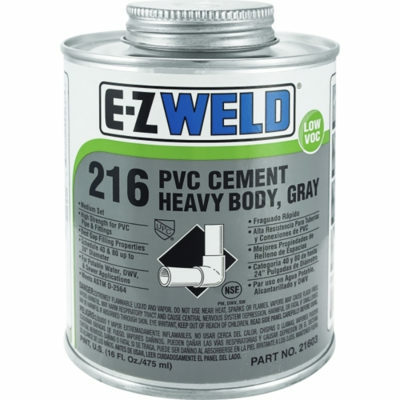 Super Heavy Bodied Gray PVC Cement heavy bodied is specially formulated for large diameter pipe applications up to 30” diameter and applications requiring high gap filling properties.